The inside of the tote tank is smooth so that it doesn’t trap odors or debris, and sloped toward the drain hole, making it easy to empty completely. The handle is oversized and durable, allowing you to pull or tow the tote tank without worry. The large, no-flat wheels have bearings to make them sturdier and have a large circumference to make going over rough terrain easier. 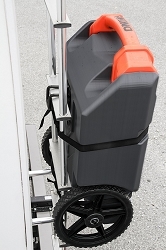 The bottom of the tote tank features an integrated ladder hook, allowing you to hang the tank on your RV’s ladder when it is empty, and tie-down grooves to hold it in place with straps. The top of the tote tank features two separate water inlets: one is an integrated tank rinser that can be used with a greywater hose, or any standard water hose with a male connection that is designated for greywater use. 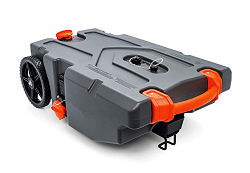 It has an easy grip connector, backflow preventer, and multi-directional spray that helps clean away debris from the sidewalls of the interior of the tote tank. The other water inlet is male connection that can be used with the included 15-inch female to female orange greywater hose. This inlet is primarily used as a vent to maintain airflow during filling and emptying, but can also be used to fill and flush the tote tank with water. Both water inlets have caps with included lanyards to ensure you don’t lose them. When dumping your RV or trailer’s waste tank, you will need the clear double bayonet elbow and the 3-foot sewer hose. The clear elbow with double bayonet ends securely attaches to the waste inlet on the tote tank and allows you to see when your tanks are empty. The 3-foot RhinoEXTREME hose has an exoskeleton design and utilizes TPE technology that protects against pinholes and offers superior abrasion resistance, crush protection, and compression for storage. The bayonet end of the sewer hose securely connects to your RV or trailer’s waste valve, and has a gasket to ensure a secure seal. The lug end of the sewer hose connects to one of the bayonet ends of the elbow. All bayonet and lug ends on the sewer hose and elbows swivel for easy use. Before filling the tote tank, attach the steel tow adapter, as it can be difficult to put in place after the tank is full, and remove the cap on the water inlet to vent air and make filling smoother and easier. Take care to not overfill the tote tank. After filling the tote tank, replace the waste inlet cap and water inlet cap, and make sure the tank rinser cap is also tightly secured. The Rhino Tote Tanks have large, no-flat wheels that make rolling over any terrain easy. Tote tanks also feature a durable, oversized handle to make pulling the tote tank more ergonomic. 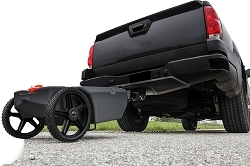 If the tote tank is too heavy when full to transport manually, included is a removable steel tow adapter which provides additional leverage to allow you to roll the tote tank like a suitcase, or allows you to tow the tote tank slowly behind a golf cart or truck. When emptying the tote tank, you will need the included sewer hose and the bayonet to 4-in-1 clear elbow. The 4-in-1 adapter securely screws into any standard sized dump station sewer inlet. When you are ready to dump the tote tank (smaller sizes) remove the waste cap on the tote tank waste inlet and securely attach the sewer hose to the tote tank and to the dump station sewer inlet. Remove the cap on the water inlet to allow airflow. Then, lift the tote tank from the handle end and allow the waste to flow out until empty. (larger sizes) securely attach the sewer hose to the integrated tote tank waste outlet with gate valve and to the dump station sewer inlet. Remove the cap on the water inlet to maintain airflow, then open the gate valve and allow the waste to flow out until empty. (both) The low drain hole and smooth, sloped interior of the tote tank make emptying easy. Be sure to close the gate valve and replace all caps before bringing the tote tank back to your campsite. The Rhino Tote Tank Kit features an integrated tank rinser water inlet that has a multi-directional spray to rinse the interior sidewalls of the tank. The tank rinser has a backflow preventer to keep contaminated water out of your hose, but because of the risk of contamination it is still advisable to never use the same hose to rinse that you would to drink. To rinse the tank, attach a greywater hose or a standard garden hose designated for greywater use to the tank rinser via the easy grip connector, turn on the water and rinse. Alternatively, the included 15-inch female-to-female Rhino greywater hose can connect to the other water inlet/vent and any standard male water connection to fill and flush the tank with water more quickly than the rinser, but without the multi-directional spray. The vent/water inlet does not have a backflow preventer, so the included hose is bright orange to designate it as “Greywater Use Only.” Once the tote tank has been thoroughly rinsed, the dirty water can be emptied in the same fashion that waste is emptied into a dump station. The tote tank waste inlet, integrated tank rinser and water inlet all have designated caps, plus lanyards so that you don’t lose them. The 3-foot sewer hose compresses for storage, and includes two storage caps to prevent drips during storage. The bottom of the tote tank has an integrated ladder hook to hang on your RV ladder. Only hang the tote tank on your RV ladder when it is empty. The body of the tote tank has grooves designed to accommodate tie-down straps, so that you can make sure the tote tank stays in place while it is hanging on the ladder.